Pine trees shed pine cones in their natural growth cycles. Pine cones are woody clusters that contain pine seeds. 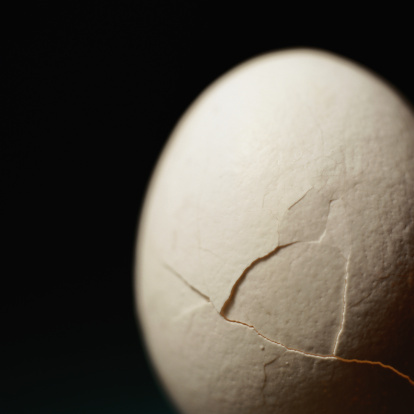 These tight clusters are usually held together by natural resin until cones are mature and open, releasing the seeds. These cones decompose into organic material. In forests, cones slowly decay and fertilize the trees above them. These same traits make pine cones suitable for mulch or compost. Pine cones fall to the ground as natural mulch. Pine cones, composed of wood scales, function like other wood mulches. As the pine cones contain resin, they shed water and disperse rain into droplets, reducing soil erosion. Due to their open cone architecture, whole pine cones encourage air circulation while protecting soil from wind erosion. Used whole or shredded, the pine cones insulate plants against weather extremes, keeping the soil cooler in summer and warmer in winter. The temperature moderation promotes plant health by keeping roots from freezing or overheating. 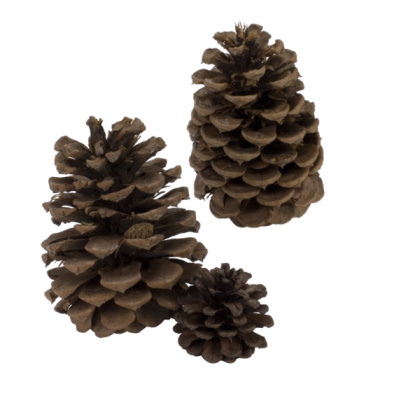 The pine cones reduce water evaporation by protecting the soil from direct sun and wind exposure. Use whole pine cones for organic mulch. Scatter whole pine cones around flowers or shrubs where dogs or cats dig holes. The brittle pine cones act as stiff barriers to pet scratching or digging. 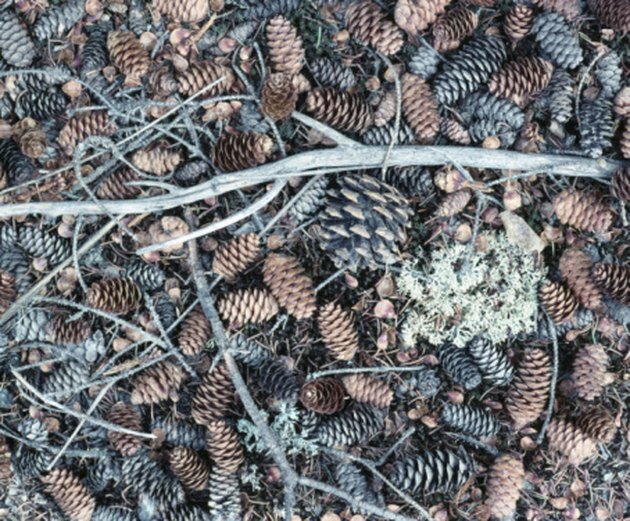 As the cones slowly decay, the bottom scales in contact with wet soil decompose first, leaving the top stiff scales as prickly protection against animal vandalism. Use whole or shredded pine cones around perennials. As pine cones decay over months or years, they provide ongoing organic fertilizer to the perennial plant roots. Pine cones provide aesthetic benefits. Scatter them on top or mix them with other organic mulches such as pine straw or cedar chips for a natural look around trees and shrubs. 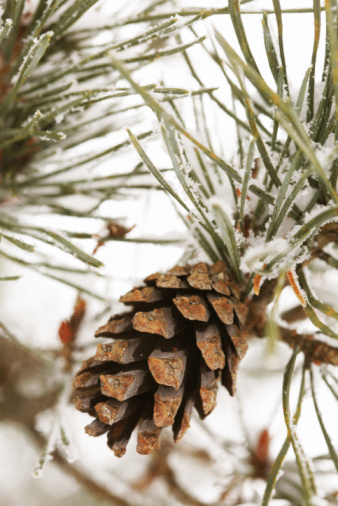 As pine cones are slow to decay, they provide little organic benefit to annual plants. Annuals require compost or fast-decomposing mulches for their short life cycle. Whole pine cones are bulky and, though common around forests, are not readily available in urban areas. Whole or shredded pine cones are not suited to slopes or in pathway areas due to their irregular shape and resin content. Both characteristics make cones slippery and unsafe for foot traffic. Pine cones, due to their pine resin content, are highly flammable. Used as fire tinder in many areas, some pine cones explode into flame at a spark. Do not use them around homes or barbecues where a stray match or spark could set them ablaze. Some pine trees are susceptible to fungus disease. These diseases are spread to the pine cones. The cones, in turn, carry the diseases into urban landscapes. Do not use cones with small black specks or other fungus-type spots. What Are the Uses of Pine Needles?